DEFENDING champion Don Bosco Technology Center (DBTC) displayed its supremacy in the Cebu Schools Athletic Foundation Inc. high school division football tournament with an emphatic 18-0 thrashing of the University of San Carlos-North Campus (USC-NC) yesterday at the USC-Technological Center pitch. Eight players scored for DBTC in the most lopsided win of the season, with Junjay Arizabal and Miguel Caindec leading the carnage with four goals each. 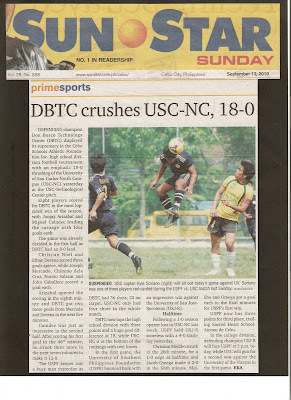 The game was already decided in the first half as DBTC had an 8-0 lead. Christian Noel and Ethan Decena scored three goals apiece, while Joseph Mercado, Chimmo dela Cruz, Nonito Salazar and John Caballero scored a goal each. Arizabal opened the scoring in the eighth minute and DBTC got two more goals from Mercado and Decena in the next five minutes. Caindec was just as impressive in the second half. After scoring his first goal in the 46th minute, he struck three more in the next seven minutes to make it 12-0. The USPF keeper was a busy man yesterday as DBTC had 36 shots, 23 on target. USC-NC only had four shots in the whole match. 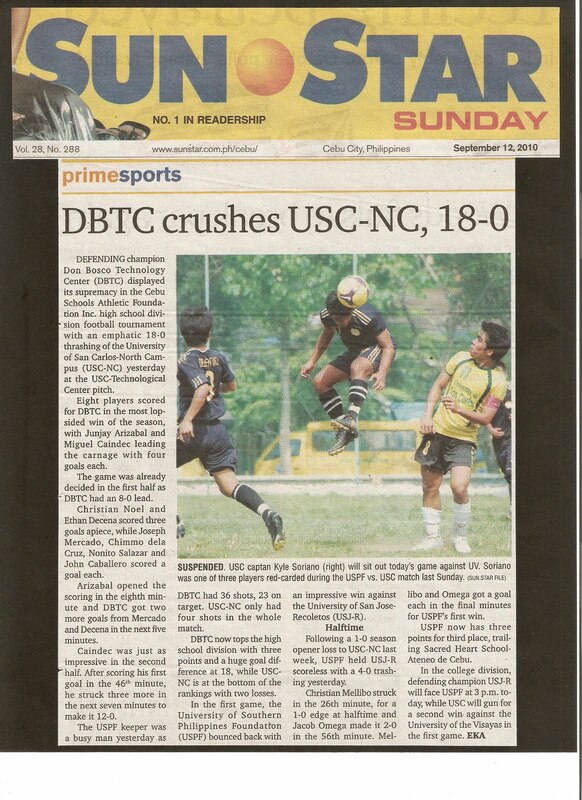 DBTC now tops the high school division with three points and a huge goal difference at 18, while USC-NC is at the bottom of the rankings with two losses. In the first game, the University of Southern Philippines Foundation (USPF) bounced back with an impressive win against the University of San Jose-Recoletos (USJ-R). Following a 1-0 season opener loss to USC-NC last week, USPF held USJ-R scoreless with a 4-0 trashing yesterday. Christian Mellibo struck in the 26th minute, for a 1-0 edge at halftime and Jacob Omega made it 2-0 in the 56th minute. Mellibo and Omega got a goal each in the final minutes for USPF’s first win. USPF now has three points for third place, trailing Sacred Heart School-Ateneo de Cebu. In the college division, defending champion USJ-R will face USPF at 3 p.m. today, while USC will gun for a second win against the University of the Visayas in the first game.